As it nears its climax, Game of Thrones is falling apart. Character moments fall by the wayside as the show steamrolls toward its big finish. In the opening scenes of Game of Thrones’ first episode, a hapless member of the Night’s Watch witnesses the horror of the White Walkers firsthand. His companions slaughtered, he flees south of the Wall where he is ultimately captured and beheaded. When Ned Stark brings the blade down on this deserter’s neck, his message is clear: Whether there are monsters behind you or treasure ahead, you stay on the road that you’re walking, and you stick with the people who march beside you. It’s a lesson that the series’ writers seem to have forgotten. That early sequence works because its horror and pathos both play out on a human scale. We see an unspeakable evil through the eyes of an ordinary man, and his concerns are entirely his own: Just before he kneels for the last time, he begs Ned to tell his family that he was “no coward.” Having seen terrible things, he wants nothing so much as a connection with those he loved. In its early seasons, Game of Thrones obeyed a similar logic. We knew that there were strange powers gathering in the north, but the show’s scale remained resolutely personal. When Jon watches the Night King raise the dead of Hardhome in the fifth season, for example, it’s the walking corpse of his friend Karsi that shows us just how monstrous these monsters are. The series has, in short, managed to get away with magical goings-on in large part because the relationships between its characters give otherwise abstract forces an emotional edge. Their bonds and their feuds, their debts and their grudges imbue the narrative’s less plausible elements with the aura of realism. That effect has grown harder to maintain as the series’ mystical master plot has become increasingly dominant. As it does, the personal and political scheming that have long anchored the show seem to operate in a space and time of their own, distinct from the more global story that looms ever closer. Many of its characters have, in effect, been left pulling double duty—sometimes grappling with existential threats, sometimes with more mundane responsibilities. The audience’s attention winds up similarly divided, such that we’re constantly being pulled from eldritch battlefields to throne-room scheming and back again, with little to tell us where or when these distinct threads might intertwine. That storytelling schism has rarely been more stark than in the seventh season’s penultimate installment, “North of the Wall.” As the episode opens, the camera crawls slowly over a war-room map of Westeros, a striking image scored only to the sound of a crackling fire. It then cuts to Jon’s motley band of adventurers, making their way through the largely uncharted terrain beyond. 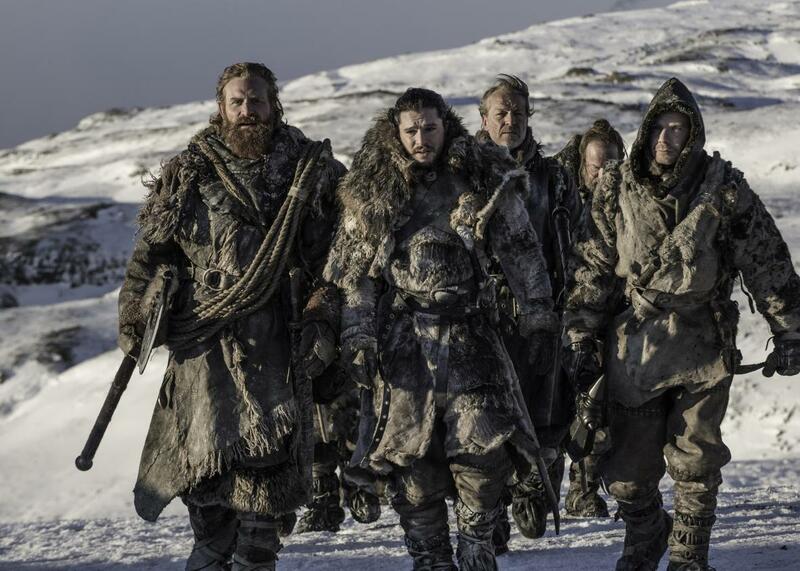 For the next few minutes, they intermittently split off into groups of two and three: Jon and Jorah banter over which of them is the rightful owner of the sword Longclaw, apparently unconcerned that the former would be unarmed if he actually handed it over; the Hound and Tormund negotiate their divergent feelings about Brienne, whom one would like to kill and the other marry; Gendry airs old grievances against the Brotherhood Without Banners, who delivered him to a bloodletting high priestess. These are small moments, but what they add up to is serial television at its best, each character weighed down and pushed ahead by the facts of his or her personal history. Even their fight against a zombified bear reminds us of what the characters carry with them. When the Hound, normally a savage and relentless combatant, catches sight of the beast, now engulfed in flames, he freezes. As we’ve just been reminded, he still lives with the literal and figurative scars of his own fiery childhood torments. His paralysis is evidence of the past’s pull, a reminder that every new mistake unfolds on the model of older sins. As soon as our characters collide with the army of the dead, however, those complex legacies go by the wayside. One by one, a procession of indistinguishable extras fall to the horde, even as our main characters—with the exception of Thoros, who succumbs to his wounds from the earlier battle—manage to prevail, their survival ensured by their still unfinished stories. Instead of complicating their connections to one another, the fight primarily serves to dramatize the enormity of the Night King’s menace. Even our heroes’ signature weapons seem to switch hands interchangeably: Tormund wields Gendry’s hammer—the icon of his relationship to his father, Robert Baratheon—in the early going, and the Hound seems to pick it, or something that looks a great deal like it, up later. Viserion the dragon may die, and Benjen Stark may sacrifice himself, but for all the sense of epic occasion, the proceedings still feel almost perfunctory, unshackled as they are from the events unfolding elsewhere and those yet to play out. The episode drives this home further when we leap to south to Winterfell, where Arya and Sansa continue to feud. Driven by grudges that have been brewing since the pilot, their mutual frustration has real resonance, but it also feels detached from the more important developments playing out elsewhere, since its scale and stakes are so much smaller. In one jagged scene, Littlefinger advises Sansa to turn to Brienne for protection from her sister, and in another Sansa sends Brienne to King’s Landing in her stead. Perhaps she’s concerned about Arya’s growing bond with the knight, but the decision still rings hollow. It feels like showrunners David Benioff and D.B. Weiss are simply shoving pieces around a board rather than moving them according to the dictates of their existing relationships, like an impatient chess player who’s suddenly abandoned the rules. Much has been made of Game of Thrones’ increasingly incoherent relationship to time and place. As Kathryn VanArendonk suggests, its sudden leaps from one place to another may be forgivable; even without cockamamie theories to explain them, we can and should accept that some of those shifts make for better storytelling. Nevertheless, they may also speak to the show’s larger problem: its inability to find a balance between its complex political maneuverings and the more familiar framework of heroic fantasy. In its early years, the series used the former to undermine the latter’s familiar progression—as it did when it killed off honorable patriarch Ned Stark—but those same tropes now threaten to overwhelm everything that once made the show compelling. As Game of Thrones careens toward its conclusion, with six final episodes projected to arrive in 2019, we can only hope that its showrunners pull their story back onto solid ground. In a trailer for the coming season finale, “The Dragon and the Wolf,” Jon somberly intones, “There is only one war that matters. And it is here.” It’s a pronouncement that promises an end to the incoherence that has bedeviled the show for too long. But it may come too late for a story that has already lost its way.